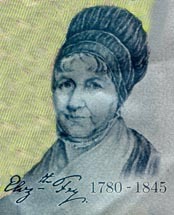 Elizabeth Fry (1780-1845) social and prison reformer, was an elder sister of Daniel Gurney of Runcton Hall. She visited her brother on occasions (for example in 1827 when she helped nurse Daniel's infant son who was dangerously ill, and in 1837 following the death of his wife, Lady Harriet). She also made a special visit in the final months of her life. In 1816 her eldest daughters, Katharine and Rachel had stayed with Daniel Gurney to ease the Fry's domestic burden (after the birth of Elizabeth's tenth child and during a slump in the Fry's trading and banking business). Rachel was later to become the wife of Francis Cresswell and mother of Samuel Gurney Cresswell. Henry Bell (1647-1711) architect, designed the Church. Henry Bell belonged to a wealthy merchant family and twice served as Mayor of King's Lynn. He was well educated and had travelled on the Continent. His early works were carried out in Northampton where, in 1676 he met the architect and scientist Robert Hooke. Hooke had collaborated closely with Christopher Wren in the rebuilding of London after the Great Fire of 1666, and these experiences would have been shared with Bell. In 1683 Bell built the Custom House in King's Lynn and was architect and one of the trustees for the rebuiding of North Runcton Church. Its design reflects the forms used by Wren in the capital, for example St. Mary-at-Hill. Nevil Maskelyne (1732-1811) astronomer and physicist, was a curate of North Runcton Church. In 1782 he was made curate by Trinity College, Cambridge, patron of the Church. It was at Trinity that Maskelyne had gained his degrees and doctorate of divinity. He was the founder of the Nautical Almanac and he became the fifth Astronomer Royal in 1765, at the age of 32.